I am great at starting projects, and I’m great at shopping. This is not always a great combination as I find “must have” new fabric, patterns, vintage craft kits, etc. It often feels like the new project has barely gotten underway when another new thing acquired on a shopping trip takes its place. This results in a dresser full of things to finish – granted it’s organized into project bags and well labelled, but it’s still a constant reminder about how easily I can get distracted. 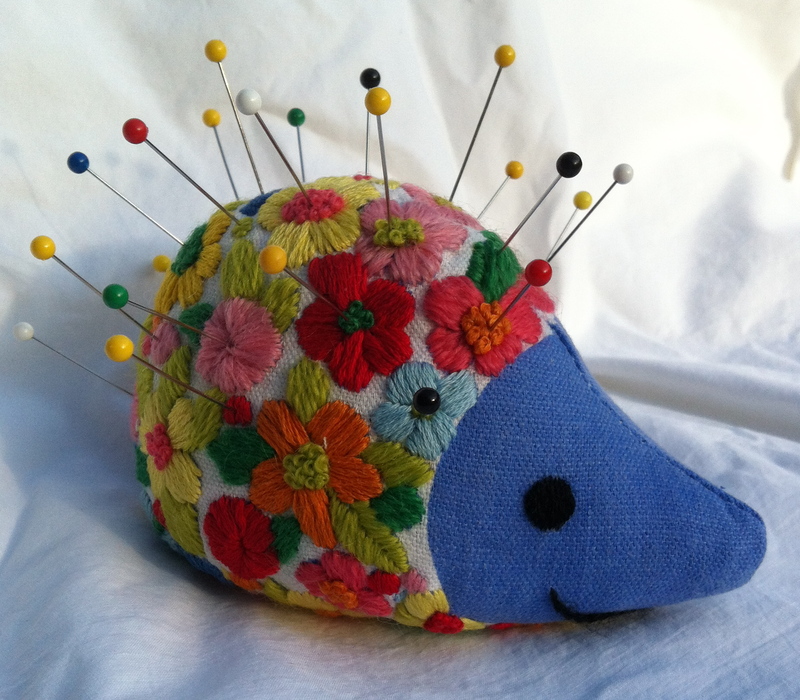 This little hedgehog pincushion is something I started four or five years ago. It began as a vintage 1970s craft kit I found unopened at a yard sale for $2. 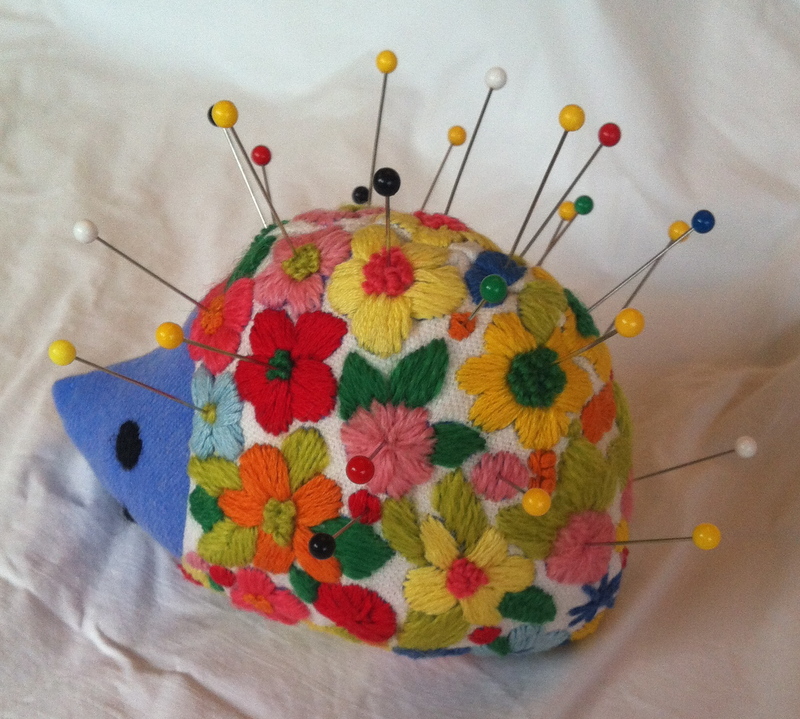 I loved the sweet and happy look to it, plus I needed a pincushion, so I felt that purchasing it was OK as it had a function and wasn’t another project to work on that I had no idea what I’d do with once it was finished. And I liked it for the fact that it was embroidery and then assembling, so it was “multi-dimensional” skill usage. The embroidery went quickly, even though some of those flower centers proved tough to keep sewing into with the wool crewel yarn as the thickness built up. I didn’t have a sewing machine at the time, so I thought I’d just hand sew the pieces together, and that’s when the project started to fall apart – I just couldn’t get the seams lined up well enough so they wouldn’t show when I turned it inside out to stuff it. It went in and out of the unfinished project drawer for a couple years, until I tried a new approach at finishing – buying the perfect stuffing! This was emery sand for weight and to keep pins and needles sharpened, but it didn’t move me any closer to finishing, so back to the drawer. Fast forward to my present avoidance of working on the five different sock monkeys I have started, and I decided to hit the temple of unfinished business. Not just for something to work on, but to hopefully inspire sock monkey sewing again. 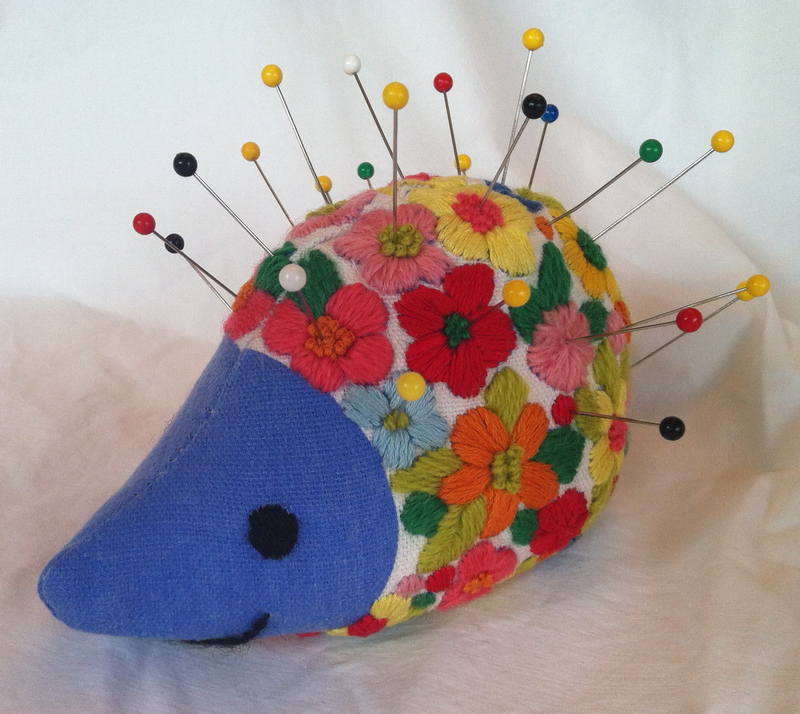 I started by taking out all my hand sewing, and put the hedgehog together by machine sewing. It didn’t go right the first time, but it was much faster and easier to whittle down that seam allowance mark by machine, rather than by hand. Next I made a couple “pillows” of emery sand to pop in his nose and tummy. I used a double layer of muslin so the sand wouldn’t leak out. Finally, I stuffed fiberfill around the pillows and sewed him up. Finished result: adorable and functional! And one less piece of unfinished business in my craft zone. But as I’ve come to learn all too well, nature abhors a vacuum, and garage sale season is about to be in full swing – time to reload! This entry was posted on April 12, 2012 by scootrah. 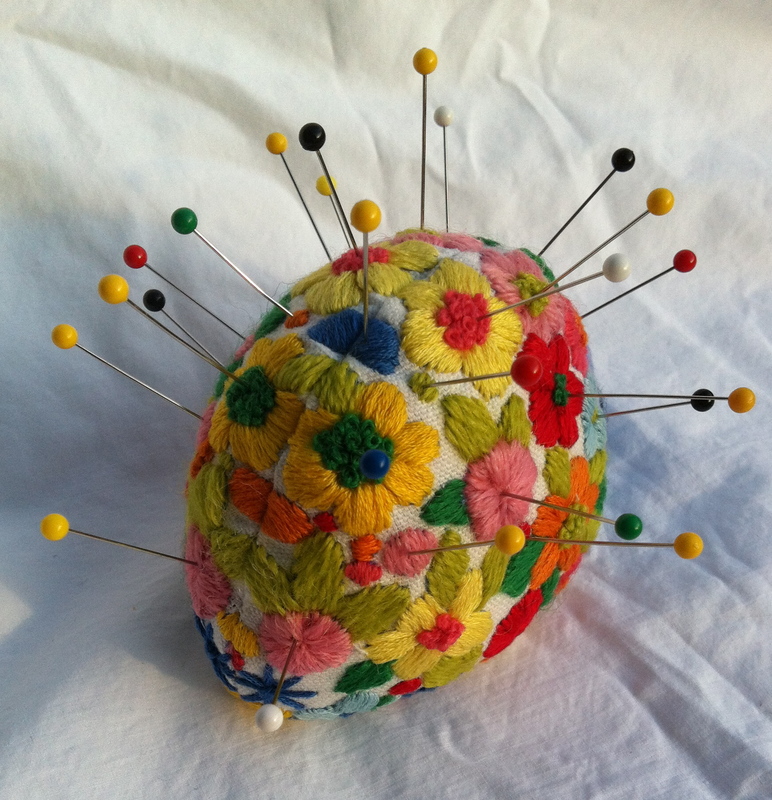 It was filed under pin cushions, Uncategorized, vintage craft kits and was tagged with hedgehog pin cushion, Scott Arend's sock monkeys, vintage craft kits.